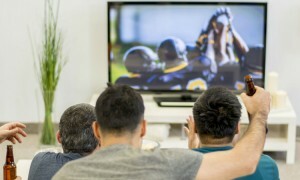 Games as big as the Super Bowl require a larger than life experience. You want a really big TV, some exceptional snacking options and an incredible place to watch the game. We went hunting for just the right type of room to watch the Super Bowl on coldwellbanker.com and came across 848 homes currently for sale that have the term “man cave” in the property description. This weekend is the big game. Scratch that. It’s THE game of the year. Whether or not you could care less about the Ravens or don’t know how to spell the last name of the QB on the 49ers, chances are you’re watching this football game. Even if it’s just for the ads. Games as big as the this require a larger than life experience. You want a really big TV, some exceptional snacking options and an incredible place to watch the game. We went hunting for just the right type of room to watch the game on coldwellbanker.com and came across 848 homes currently for sale that have the term “man cave” in the property description. An entire wall dedicated to a screen. Now that is a viewing room. Who cares that there is no furniture in the room? That means there’s nothing obstructing your view! Currently listed by Coldwell Banker SEAL in Lake Oswego, OR. There are man caves that are great for watching a game and then there are man caves for experiencing a game. This is the latter. Two big screen TVs flank the walls of this man cave with a pool table in the middle and plenty of seating for even the largest of gatherings. Currently listed by Barbara Pugh with Coldwell Banker Sea Coast Advantage. Now this man cave has some class. Theater seating on what look to be ridiculously comfy couches and a massive screen on the wall for enjoying every touchdown. I would love a Fathead of Adrian Peterson on the wall, but that’s just me. Currently listed by Chad Gradowski with Coldwell Banker Residential Brokerage in New Buffalo, MI. This man cave appears to be more suited for the Academy Awards than the big game, but we see it’s potential for it. Leather seats are a must for any man cave and this one has that in spades. Currently listed by Patrick DiPinto with Coldwell Banker Residential Real Estate in Longboat Key, FL. Beyond the man cave, this home is incredible. 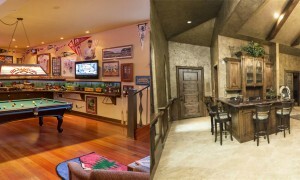 I think I saw a big screen TV in a walk-in closet in the photos on coldwellbanker.com, but this man cave takes the cake. Amazing widescreen on the wall for watching the game, plenty of room for guests, and ottomans for kicking back and enjoying football and eating massive amounts of wings. The only thing missing is a bobble-head collection lining the walls to class the place up a bit. Currently listed by Ginger Glass with Coldwell Banker Residential Brokerage in Beverly Hills, CA. This season, take the opportunity to host some friends and family at the comfort of your own home – your very own home field advantage.